Cook the rice according to packet instructions. Spread the cooked rice over a large flat tray and refrigerate until cold. Break up any lumps with a fork. Heat the vegetable and sesame oils in a large wok over high heat. Add the chicken and cook, stirring, for 1 minute or until golden. Add the ginger and cook for a further 1 minute. 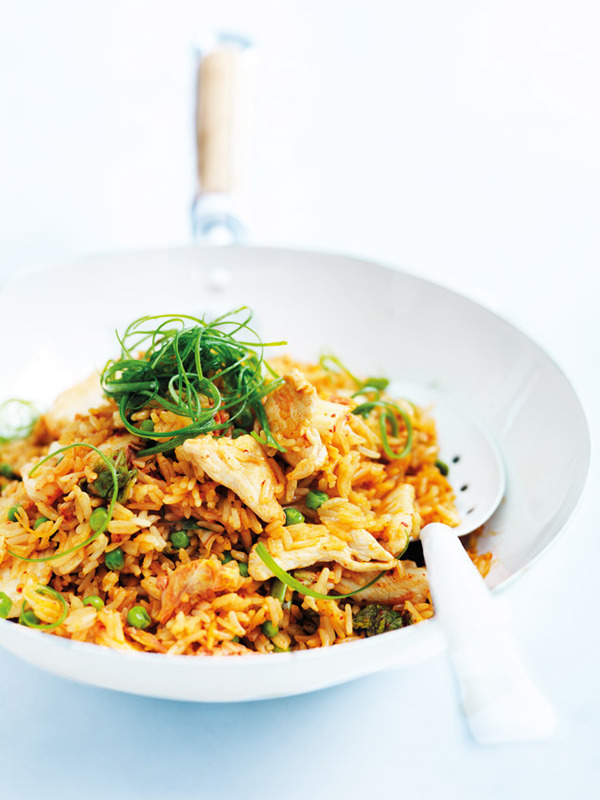 Add the rice, kimchi, peas and soy sauce and cook for 2–3 minutes, breaking up any lumps with a wooden spoon. Serve topped with the green onion. Serves 4. Tips: Leftover rice that’s been in the fridge (up to 1-day old) is perfect for making fried rice – it’s firmer and less likely to become lumpy. You’ll need 4 cups of cooked rice for this recipe. You can find ready-made kimchi at Asian supermarkets and grocery stores.